Note that Office of President is directing that money be deposited in a private Bank account and using a letter head from His excellency’s Office. Only in Kenya, a failed State. Uhuru’s government is the same as his father’s 10% one, MOI’s corrupt one and Kibaki’s corrupt one that said no more harambee to be conducted by Government officials. The same garbage yet he and Ruto lied they are part of the digital generation. elephant tusks are being harvested at a higher rate now that when Uhuru’s step sister and his mom Ngina traded in them in the 1970s. Pathetic that he still appoints Kikuyus within top positions and there is no serious fight against corruption.Within September, Uhuru recruited so many Kikuyus to top Government positions ignoring the fact that he signed a 50-50 deal with Ruto which included sharing top jobs. This home coming habit was developed under Kibaki and it is a clean waste of money. Ole useless should go back to Utalii College or take care of his goats and cows. The Loitokitok Sub County District Commissioner, Mr Kelo Harsama, said the letter from his office asking for contributions was drafted by the hotel proprietors. Mr Harsama said his office was only facilitating the process after the hotels’ management asked them to do so, to make the process official. Mr Harsama said the more than 10 hotels that showed interest in being party to the event have not been forced to contribute, and there is no fixed amount for any hotel. “The hoteliers approached us expressing their wish to join in celebrating together with the Cabinet Secretary, who has also been in the hotel industry for long. It was their idea,” Mr Harsama said. He said nobody has complained over the move as it is a tradition among the area residents to come together whenever there are such forums in the area. The homecoming ceremony was called off at the last minute following the Westgate terrorist attack that left more than 60 people dead and hundreds injured. 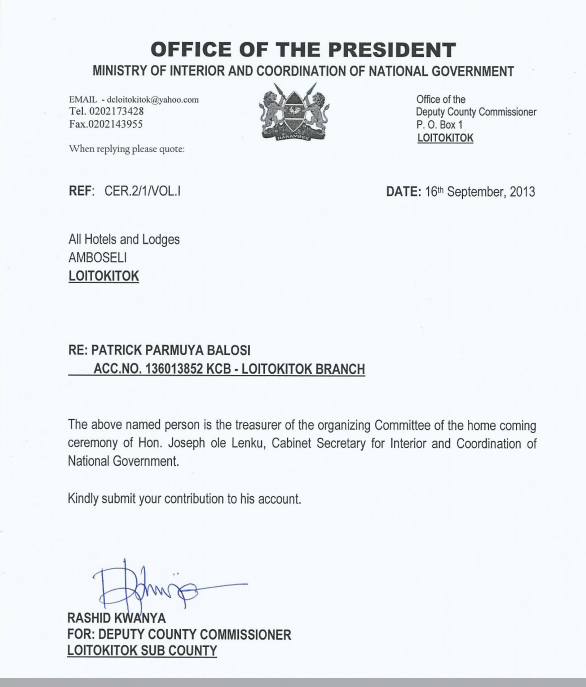 The mail dated September 16 asks all hotels and lodges within Amboseli in Loitokitok to submit their contributions through Mr Patrick Parmuya Balosi, whose account number is given as, 136013852, Kenya Commercial Bank-Loitokitok Branch. “The above named person is the treasurer of the organising Committee of the home coming ceremony of Hon. Joseph ole Lenku, Cabinet Secretary for Interior and Coordination of National Government. Kindly submit your contribution to his account,” the letter read. The letter, Reference number, CER 2/1/VOL 1 from the office of the Deputy County Commissioner, Loitokitok, is signed by Mr Rashid Kwanya for the Deputy County Commissioner, Loitokitok Sub County. There are fears that some senior Government officials could be using their positions to solicit funds to offset their public events. Whereas those asked to offer cash donations are not forced to comply, many of them are left with little choice.